FlySAA flight is South Africa's flag carrier and operates domestic, regional and international flights! FlySAA is another name frequently used by our national carrier, South African Airlines (SAA). As one of the biggest and arguably the best airlines in Africa, it naturally has a big online presence. Besides having an online booking engine and website, FlySAA are also active on most social media platforms, often making use of the name FlySAA/flysaa. 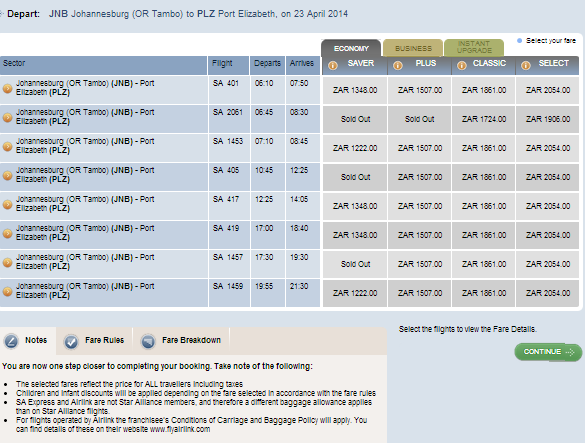 As a result FlySAA has become a popular search term when looking for South African Airways. FlySAA's website URL is www.flysaa.co.za and both their Twitter and Instragram handles are @flysaa. On Facebook their page's title is FlySAA. FlySAA flies to 24 destinations in Africa and 14 international destinations, bringing the total to 38 destinations. FlySAA are based in Johannesburg with all their flights originating from OR Tambo International Airport. FlySAA is however no stranger to controversy, with chairperson Duduzile Myeni being the chief instigator. The biggest controversies surrounds their continued government bailouts and the Airbus deal. FlySAA is based at OR Tambo, Johannesburg. They offer domestic, regional and international flights. Find a full list of all their routes here. If online bookings confuse you, please find out step-by-step guide below to see all the stages in the booking. Step 1 : Navigate to SAA's website. 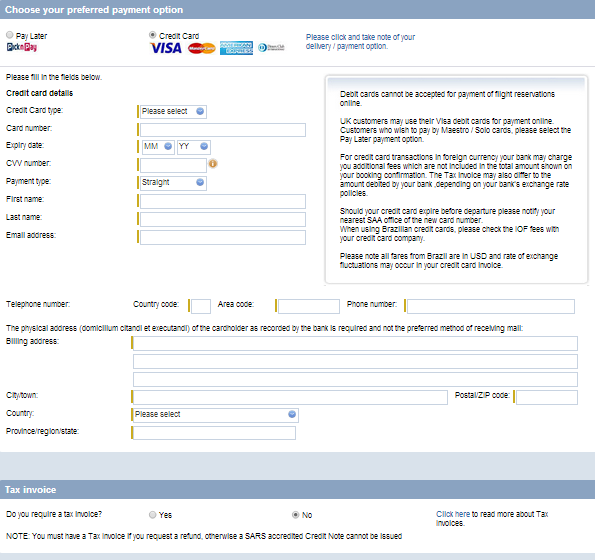 Notice the flight bookings tool on the left-hand-side of the page. Step 2 : Fll in your Departure City, Destination City (or click multi-city if there's a 3rd airport you want involved), date you're leaving and date you're returning. If you'd like to fly 1-way, then uncheck the "Returning" checkbox. Fill in the number of adults/children and infants. Select whether you'd like to fly Economy or Business Class. Then click the green "BOOK" button. Step 3 : The flight numbers, airfares and various departure and arrival times are then displayed. 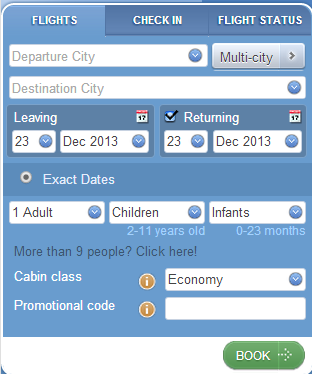 By default economy class fares are show, and if you'd like to book business class then click the BUSINESS class tab. Airfares are shown for 4 different categories: SAVER, PLUS, CLASSIC & SELECT. SAVER bookings are non-refundable, rebooking & upgrade fees apply and earn limited Voyager miles. PLUS fares have a cancellation admin fee applicable, rebooking fees and upgrade fees apply, and limited Voyager miles are earned. CLASSIC bookings have a cancellation admin fee, rebooking & upgrade fees, but earn full Voyager miles. 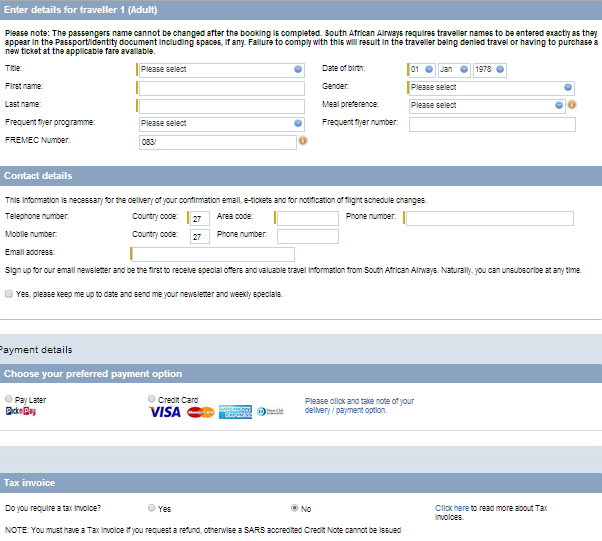 SELECT bookings are the most expensive, and no cancellation fee, no rebooking fee subject to the same class being available, earn full Voyager miles and are Voyager upgradable.When you click on the price then SAA indicate what type of aircraft is being used and the airline (bookings on the SAA website could be any of its codeshare partners, like SA Express, SA Airlink, Mango Airlines or Emirates). You can identify Mango flights on the SAA website as they have flight numbers in the range SA2000 to SA2099 and SA7900 to SA7999. Step 5 : Click the green CONTINUE button if you are happy with the flight details. Read and scroll down past "Fare Rules", "Baggage", Meal Requests, Airport Taxes Travellers with reduced mobility & Passport & Health info. Then fill in the details for all the passengers, making sure that they are the same as on travelling documents. Also fill in the relevant contact details. Step 6 : Scroll a bit further down and select your preferred payment option : Either pay later via Pick 'n Pay, or pay now via credit card. The click on the green button at the bottom right to book and pay (if you've selected a credit card transaction). Skip the queues and rather check-in online anywhere. This way you can already print your boarding reference number, drop any baggage you need to be checked in at the baggage drop-off counter and head straight through for boarding. Online check-in is possible at the following airports in South Africa: Bloemfontein, Cape Town, Durban, East London, Johannesburg, Kimberley, Maseru, Manzini, Mmabatho, Mthatha. Alternatively you can make use of the self check-in machines in selected airports to print your boarding pass. FlySAA is active on Twitter, frequently responding to passenger complaints and praise, sharing specials and updates and occasionally retweeting beautiful pictures like the one of the right. This is your definitive source for up to date information on everything from the latest special to flight delays. If you want your plane pic (please don't make it plain!) 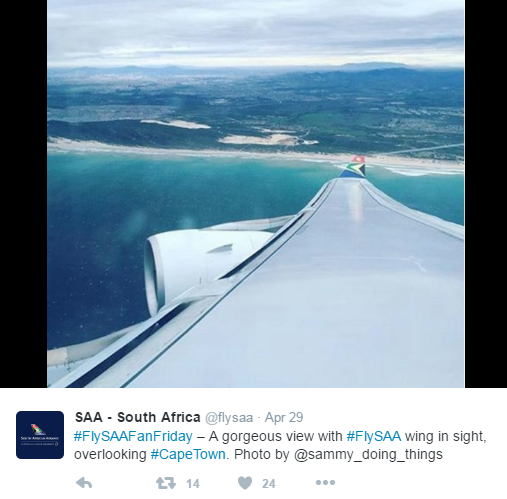 featured on their page, tag it with #FlySAAFanFridays and #FlySAA so that they can share it. Each Friday they share a fan pic, hence #FlySAAFanFriday. Follow them at the username @flysaa. FlySAA makes daily Facebook posts about competitions, flight specials, the SAA Voyager programme and other relavent topics. Although they seem to be quite active, they rarely reply to the large number of complaints on the page. If you've got a gripe with FlySAA, best share it on Twitter where you'll likely have a bigger audience and could possibly get a helpful response. If you'd like to keep up to date with the latest FlySAA posts on Facebook you can follow them at @FlySAA. The airline's in-flight magazine is also available online, with a free subscription available via MySubs. Simply create an account and subscribe to the magazine. You'll receive an email link to a downloadable PDF version. Each month we document what SAA chairperson says in the magazine here.